Worst day ever. I was supposed to meet my wife at hospital for our first baby. Now I’m stuck home just refreshing hoping the game comes back on. Thanks cg for me missing my first baby’ Birth. You have issues bud. Think they have counseling for things like this. "IF" you survive your wife's wrath. This is what happens when a online game company focuses on money making toons instead of making sure their servers are working top notch for their players. There is no rule that says both can't be done, but I understand the sentiment. Can we get the server maintenance while it's down? You know, efficiency and all? Um.... I sure hope I dont miss my energy refresh from 1:00 because of this.... so irritating. Still not working and its Arena Payout. @CG_SBCrumb are there a chance for fleet payout compensation? don't have enough money to pay the server farm ? Seems I got unbanned, just in time for this fun. Great how this happened at most peoples payouts, mine included. I'm sure they'll replace the amoeba on the wheel shortly, hamsters are too expensive to feed even with all the Revan gold they've acquired. I do hope the guy with the wife is joking. Else he's not long for this world. I just got a "server maintenance" message in-game. They are linking to an old Page, REALLY???? 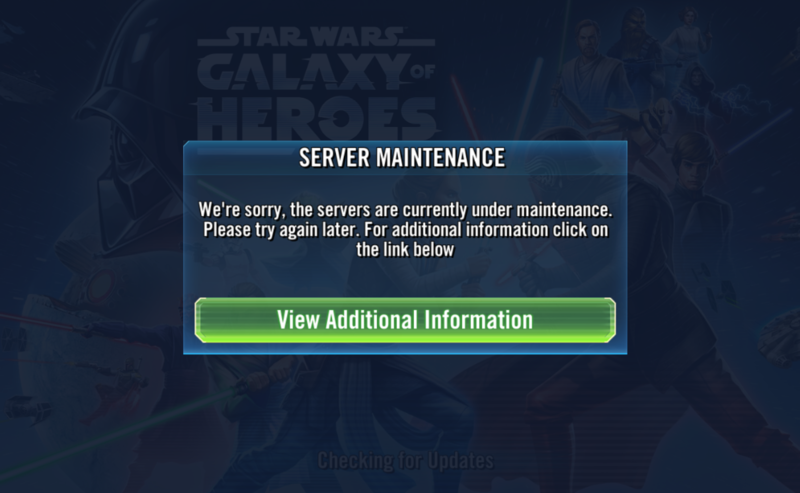 Looks like there is a Server Maintenance notice now. Great timing, fleet payout in 25 minutes. So no one has ever had a computer crash? It happens. It stinks, but it happens. Thanks @CG_SBCrumb for getting on top of the issue so quickly. 25 mins for my Arena Payout and can't log in. Train Yourself To Let Go Of Everything You Fear To Lose - Yoda. Nice work directing us to a post through an link on the loading screen which hasn't been updated for over a year that says everything is fine. Top job. Irked we can get a note regarding the outage but still no post on the Road Ahead.